Yesterday was the Cherry Tree 10 mile race, 3 loops around Prospect Park, organized by the Prospect Park Track Club. This was originally not on my radar, because I’m deep in marathon training, and I knew this race was at the tail end of a vacation I was taking in California. However, once I realized the race was Sunday, and I was flying in on Friday night, I convinced myself that the 10 mile race is a perfect opportunity to practice race conditions and signed right up. The race also offers a relay option, which looked like a lot of fun – teams of three where each person runs 1 loop of the park. First off, in terms of goal, I fully expected to PR this race. I had only ever run 3 races at the 10 mile distance, and my PR was set way back in 2002, at 1:31:54. Considering that time is 9:15 pace, and I just recently completed the Manhattan Half Marathon in 9:05 pace, I would have been upset if I didn’t PR. Considering this race was 3 miles shorter, and an easier course (besides the big hill heading up to Grand Army Plaza, Prospect Park is really not that bad), I wanted to get my pace under 9:00, and finish sub 1:30. Few really nice things about this race. First, the 10am start time. Most NYRR races these days start at 8am, or earlier for some of the long ones, so I really appreciated the extra time to get out there. Also, number pickup, bag check, and post race spread, was indoors at Bishop Ford HS, a 10 minute walk from the start. Plenty of parking at the school. This made for a very relaxing, and WARM, time in getting ready for the race and unwinding at the end. They even offered massages afterwards. The final nice thing about this race is the small field. There were less than 1000 participants, much smaller than any NYRR event, most of which fill out at 5000 people. The Haiti run this weekend had no cap, and over 9000 finishers. OMG, holy traffic jam! So, overall, this was a fantastic experience. Having a school to go to after the race for bagels and hot chocolate reminded me of the good ole days when NYRR used to do this for all of the winter races. Those days are long gone, so this is a great throwback. Pre race, I was having flashbacks to October, when I ran the Nike Human Race. It had a similar start position in the park, and so the first 6 miles would be a great approximation of how much improvement I’ve had since then. On that day, I went out way too fast in the first mile, suffered shin splits, and had a rough race, finishing in 58:52, or 9:26 pace. I was clearly not looking for a repeat performance. On to the race itself. I was able to get pretty close up to the front and so had ZERO congestion at the start of the race. Again, I found myself running a very strong first mile, TOO strong. Mile 1 was 8:34. I know full well that I cannot sustain that pace over 9 miles and so tried to dial it back. Once I came around to the start area again, I realized that the start line is on a downhill. That probably explains why mile 1, twice in a row, was too fast. This time, luckily, my shins cooperated and did not flare up. Slowed the pace to 8:54 and 9:00 in the next 2 miles. I really wanted to keep the miles in the 9:00-9:10 range, hoping that I’d be able to run a couple of stronger miles at the end to get me in under 1:30. It did work out that way. You can see that mile 5, 6, and 7 were very consistent. Mile 9 was the slowest, but this included the 3rd time up the big hill, so perfectly understandable. At mile 9, I was at 1:21, so knew I had 1:30 in the bag, only needing a 9:00 final mile. The last mile had lots of downhill, and with a little pushing, pulled off a strong 8:23, my fastest mile. Finishing time was 1:29:19, a 8:56 pace. My time of 1:29:19 was good enough for 385 out of 736 finishers, so close to 50th percentile! Happy to add another PR to the record book, my first since Coogan’s 5K, almost a year ago. 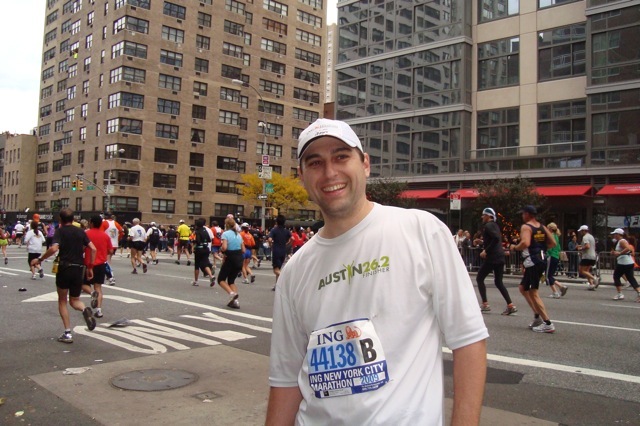 Saturday, Oct 24, 2009, was “the day the world runs”, and I took part in the New York event, a 10k race in Prospect Park in Brooklyn. I jumped at the chance to run this race, because, I enjoy running in Prospect Park and rarely do. Only chance I really have has been at the Brooklyn Half Marathon, which I’ve done on and off over the years. This 10k race was also the perfect taper event for 8 days before the New York City Marathon. Weather was potentially a factor, but luckily, it held out and there was no rain. Rained hard overnight, but stopped early in the morning. By racetime, only remnants were the wet roads and the humid air. It was actually quite humid, but luckily not too hot at about 60 degrees. Showers started to kick in after the race, but thankfully the race itself was dry. Start was at 8am, so 5:30 alarm, 6:15 out the door, and arrived at the park around 7:15. Plenty of time to get the pre-race stuff done (change of clothes, bathroom run, bag check) in a leisurely fashion. Had the bag checked by 7:40 and lined myself up with the 8 minute per mile people. I’m so used to running NYRR races in New York City, I had to keep reminding myself that this was not an NYRR event. The start was very professional, and well staged with enough port-o-potties, an organized start line by pace time, and buses to transport our bag the half mile from start to finish, and keep them dry in case of rain! But I did a double take when the announcer guy was none other than Ian Brooks, who has announced at many NYRR events over the years. Lately I’ve heard someone else doing the race announcements for NYRR, so nice to see that Ian is still out there, with his awesome British accent. Although (sorry for the mini-rant here as I am a stickler for logistics and details), he incorrectly referred to us having the D-Tag chip rather than the ChampionChip. First of all, D-Tag is not a ‘chip’, it is a ‘tag’! The confusion is because NYRR has started using D-Tag, although at the Staten Island Half, the announcer there kept referring incorrectly to the ChampionChip. Cmon people, let’s get it right! Anyway, back to the point! Shortly after 8am, the horn sounded, and we were off! I could tell right away that I was going too fast. I almost started hyperventilating early and could feel myself breathing heavy. I tried to back off a bit but keep a hard pace. My 10k PR, set in early 2007, is 52:43, and I was thinking that if I could keep my pace around 8:45, I would have a chance to PR. Then, the bad news started to surface. In the first mile, I could feel my shin acting up. I’ve had my fair share of shin issues lately and was praying it would hold off and allow me to run through it. The advantage to running in the park is that there are a lot of uphills (and downhills), but in particular, the uphills are good to loosen up the shin and sometimes make the pain go away before having to stop and walk. The big hill is in mile 2, so I felt I just needed to hold up to that point. Even with slowing down, and taking a water stop before mile 1, I crossed mile 1 in 8:15, which is way too fast. I have a feeling that marker was not quite accurate, but hard to tell. Anyway, dialed the pace back a notch, hoping it would help, and worked up the big hill in the northeast corner of the park. Crested it, and started working down the other side, but shin was still tight. Very tight. Made it as far as the water stop just after mile 3, and decided on a walk break. Walked about a quarter mile, trying to stretch it out, etc. Then started back into run mode. Shin pain was still there, but starting to abate, so just pressed along. Very soon we completed the first loop and started the second time around. This time, finally, in mile 4, as I worked up the hill for the second time, the shin pain subsided significantly. Was then able to safely push hard the last 2 miles into the finish. My biggest complaint about the race occurred here, namely the 5 mile marker placement. The placement was highly suspect, as you will see by my splits below. I am a very consistent runner, and miles 5 and 6 were run at a similar hard pace, yet you’ll see the major difference in time. Finish was actually on a nice downhill, so cruised in very fast. Finished in 58:29, which is not bad at all, but several minutes slower than I thought I could do if my shin didn’t act up. After finishing, I went out to the last straightaway and cheered many more runners into the finish. Overall, this race was great. Water was plentiful and there were many stops with lots of tables. The post race spread was great, although the grounds were completely muddy. Hope they run this again next year, and again in Prospect. If so, I will be there! And to top it all off, ended with a fantastic brunch in Park Slope with great company, namely 5 new friends met over the last year on DailyMile and Twitter. Great food and great conversation. Then off to the rest of my weekend! As I said in my August 2009 month in review post, “better late than never”. This race was almost a month ago, on Aug 22, but it is still important for me to write up the race, how I did, and my impressions. First of all, one of my goals is to run in more smaller, “local”, events. In the past, I’ve tended to run many New York Road Runners events, but those have gotten so big and stressful to deal with. Also, I’ve also decided not to try to get in the required 9 races to get an automatic entry to the New York City Marathon. Instead, I intend to focus on marathons in other states going forward. I’ve got 5 states, and look forward to trying to get the other 45 done. I will definitely still run some NYRR events, but they simply won’t be my first choice anymore. So, I jumped at the chance to run in this race. I noticed it listed in the events section of Daily Mile and was interested for 2 reasons. First, it is about 15 minutes from my weekend house in New Jersey, and second, it is a cross country race, which I’ve never run before. I almost backed out at the last minute. The races was smack in the middle of one of those rainy spells we had in August, and the forecast was for rain. Since this was a cross country race, I was a little worried about poor footing, etc. But, the opportunity to run in a small local 5k, and to try out a cross country race was too great, so I decided to go for it. And a small 5k it was. I decided to register on race day. When I showed up to register, there was some kind of commotion. Apparently, at the race location, they were missing both the list of number assignments for the people that pre-registered, and missing the stack of race numbers for race day registrants. No problem though, we were all patient about it, and they eventually received both missing items and got everyone signed in. At check in, I also got a nice looking green Saucony technical singlet! The rain started about 15 minutes before the start of the race. Didn’t seem to bad as it was some kind of sun shower, and we could sort of remain dry by standing under some trees. About 5 mins before the start, the race director herded us all towards the start area to talk through the course. It would take us around the ball fields, through the woods, around the polo field, back through the ball fields, through the woods and then around the polo field again to the finish. A few minutes later, we were off. In all, the most informal start I’ve ever seen for a race! Did I say this was a small race? There really were not that many of us. And it seemed like a healthy proportion were young, high school and college, kids, who looked very skinny and very fast. Many of them took right off and left me in the dust. So settled in with a fairly small set of middle of the pack runners. First stage of the race was through a big open field in high grass. Definitely harder than your typical road surface. About a half mile in, we entered a wooded section that was narrow, hilly, and muddy! But that section was short and we entered another large open area and ran around a giant polo field. Then, a short trip back in the woods, and another open field section, before we entered a longer wooded section. This wooded section was hilly, and very muddy. The muddiest area was on a steep downhill, so had to really cut the pace down to make sure I didn’t fall down. All of the running in the grass started to get to me, and I was losing it in the last mile – did have to stop to walk once. Crossed the finish line, in 27:46, and was handed a number, 76. Had to check in at the main tent to provide my name and race number, so that the race could be properly scored. Did I say it was a small race? Anyway, I mentioned it started raining about 15 minutes before the race. It continued to rain at the start of the race, and stopped when I was at about mile 2. When the rain stopped, the humidity was noticeable, and the sun also started to come out, making it seem really hot. Maybe another reason I bonked in that last mile. In summary, I had a blast. It was a lot of fun, but also very hard. I managed to finish at 8:57 pace per mile, slower than I would have expected in a road race, but better than I though I could do on a slippery and muddy cross country course. I look forward to maybe trying this again next year, and also looking for other small races in Monmouth County!